When hearing about the newest, latest skin saver... I'm always a bit skeptical. With my job, I've tried dozens over the years and honestly, have never found anything that totally blew me away. Until now. Today I popped into Private Edition to meet the founder of Real Chemistry and left with a purchase after hearing the founder's story and experiencing a brief demonstration on my hands. The results were immediate and totally fantastic. We had an event to attend shortly after I got home with the product, but once I was able to get out of my dress clothes and wash my face, I was ready to try it out. I also made my husband join me in the test. Within less than two minutes, we both saw tons of skin peeling off from our faces and felt an instant boost. Our trial was late at night, but there is no denying that this stuff WORKS! No burning, redness or anything that I've associated with peels in the past. Instead, the 3 Minute Precision Peel is soothing and removes dead cells that even most expensive microdermabrasion treatments miss. I had better results from this than any facial I've ever invested in-- and in record time. The packaging isn't luxury and the logo looks more drugstore than high-end, but the compilation inside the tube is beyond any expensive brand on the market. Right now, this product is exclusive to Cosmetic Market and Private Edition in Nashville, but those of you outside the city can easily order it online. For the fast, superior results it delivers, it is surprisingly affordable (as in $40). I'm thinking that this discovery of the protein peel is going to create an instant boom in the marketplace. If you want great skin, my suggestion is to get yours now while it's readily available. What's your favorite skin care savior on the shelves? Would love to hear all about it here. But, you've got to try this one, and keep following the Southern Sophisticate! 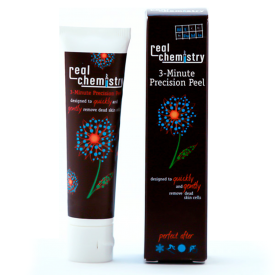 You can order online at www.myrealchemistry.com! Thanks for your kind words Stacie - we are soooooo pleased you enjoyed the product! Excited to try this out! I am like you, very skeptical of new products that claim all of these "wonderful" things. Will try it out for sure! I love Therapy Systems Balancing Gel face wash and their Sensitive Glycolic face wash. Also LOVE the retinol from Chantecaille!